Italy-based DettoFatto is an ongoing collaborative laboratory that brings together creative designers and architects to construct furniture, installations, and microarchitecture projects. naCa and Studiodeda recently teamed up with the organization to hold a workshop at FARM Cultural Park where they built a new and improved chicken coop. 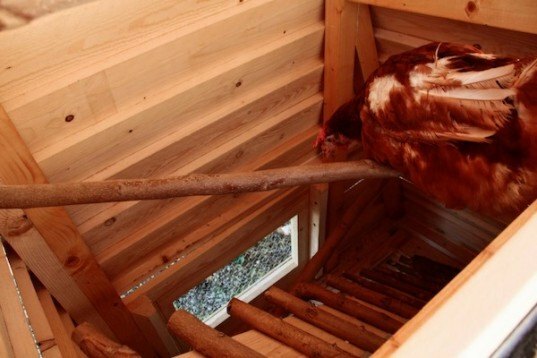 Designed in Sicily to house poultry as part of a permaculture project, the modern cages were built over a four day workshop in which the designers played with wood to form an innovative response to the traditional idea of a chicken coop. But they are more like contemporary refuges than coops with angular frames kitted out with unusual purple sections. The group create works for a variety of purposes: museums, cultural spaces, and even abandoned buildings. They use the ongoing participatory workshops as their primary spaces to share ideas using simple materials to create big and bold, and fairly contemporary ideas suited to animals or humans. Typically the creative process begins with one drawing day followed by the rapid realization of the project. 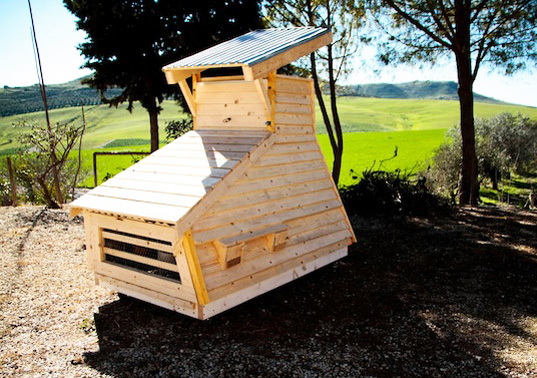 Designed in Sicily to house poultry as part of a permaculture project, the modern cages were built over a four day workshop in which the designers played with wood to form an innovative response to the traditional idea of a chicken coop. This is precisely what happened at FARM Cultural Park when the team held a workshop to build new chicken cages. Italy-based DettoFatto (SaidDone in English) is an ongoing creative laboratory that brings together creative designers and architects to construct useful microarchitecture, furniture or installations. They are more like a contemporary refuge, an angular frame kitted out in purple sections. The group create works for a variety of purposes: museums, cultural spaces, and even abandoned buildings. They use the ongoing participatory workshops as their primary spaces to share ideas using simple materials to create big and bold, and fairly contemporary, ideas suited to animals or humans.